No, that’s not a mispelling of the title of the less than awesome Mark Wahlberg movie featuring scary winds and self-abusing zombies. It is however, a twist-and-a-half on the Manhattan, and a cocktail that’s celebrates the birthday of one of our bestest Madtini buddies ever, Anne who was born on this day (not too long ago) in Helsinki, Finland. 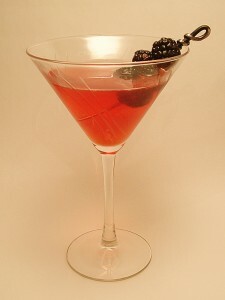 The Madtini Intoxicology crew was summoned to the lab early today (which really would be anytime before noon) to create this delicious cocktail of Finlandia vodka, cranberry juice, Chambord and blackberries. Place a martini glass in the freezer to chill for 10 minutes. Combine the vodka, cranberry juice and chambord in a cocktail shaker with 2-3 ice cubes. Shake it like a Polaroid picture for 5-6 seconds, strain and serve. Garnish with blackberries.